It's becoming more and more common to see “no GMOs” on food labels, and NOT because our government is smart enough to require this, but because WE have been loud enough so companies hear us!!! Yes, we need to buy more whole foods without labels, but sometimes it's nice to have better options when needed. Not to mention that some people just won't buy whole foods, for a variety of reasons, so it's even more important in those cases that real food is becoming more mainstream. Read more about GMOs here. Finding organics is also becoming easier. In 2004 when I became aware of all the junk in our food supply, this was RARE. For just one example, there were only a couple options for organic peanut butter out there, and you could barely get a spoon through either one! Now no matter what it is, you can almost always find a better option. Increasingly, you can even find these options at your local grocery store. (Remember “organic” isn't everything though. Here's the post from when I was on TV and the topic was “Don't be duped by the organic label.” Also, what do you think about going “Beyond Organic“? The popular Wise Traditions journal, put out by the Weston Price Foundation, is really the only publication I take the time to read, because instead of spouting the same politically correct dogma you'll hear everywhere else, you actually learn something in these pages. Economists are noticing a “seismic shift” in the way people are eating as they wake up to the dangers of processed foods. Per capita soda sales are down 25% since 1998, with orange juice consumption down 45%. Sales of package cereals are down over 25% since 2000 and sales of fast foods like McDonald's are also on a downward spiral. Industry insiders now referred to grocery store center aisles as “the morgue” as consumers have increase their intake of fruits and vegetables and of fresh prepared foods. Do you know WHY things are changing so much for the better? Because we are making a difference! We can't stop making our voices heard, because the lives of our children, our grandchildren, and all our descendants are depending on it. Click here for real food and products I recommend — but keep in mind I'm working on redoing that page now to make it more user-friendly! Click here to find a safe source of healthy pastured meat or ask at your local WAPF chapter. No local source? Click here for the online source I recommend for healthy meat. Get the Wise Traditions journal by becoming a member here. Did you know that the WAPF has a new podcast? Check it out here. Linda, I really think that might happen!! I am thrilled to be seeing no GMOs on some of the packaged food in the stores. 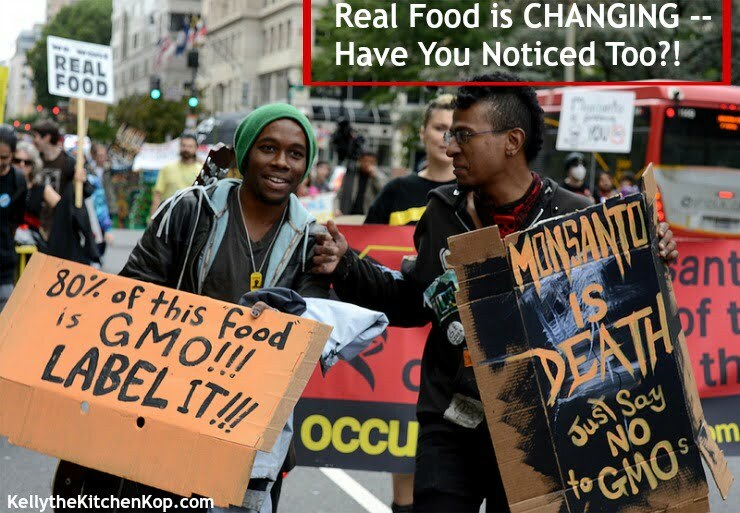 As more and more people let their voices be heard we may eventually see the death of Monsanto. You’re helping to make the positive changes, Kelly! Kudos to you.